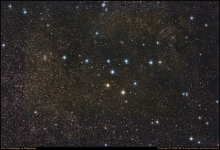 The Image of the Month for May 2013 is the recent reprocess of the Coathanger Cluster (Al Sufi’s cluster, Collinder 399) in the constellation Vulpecula. 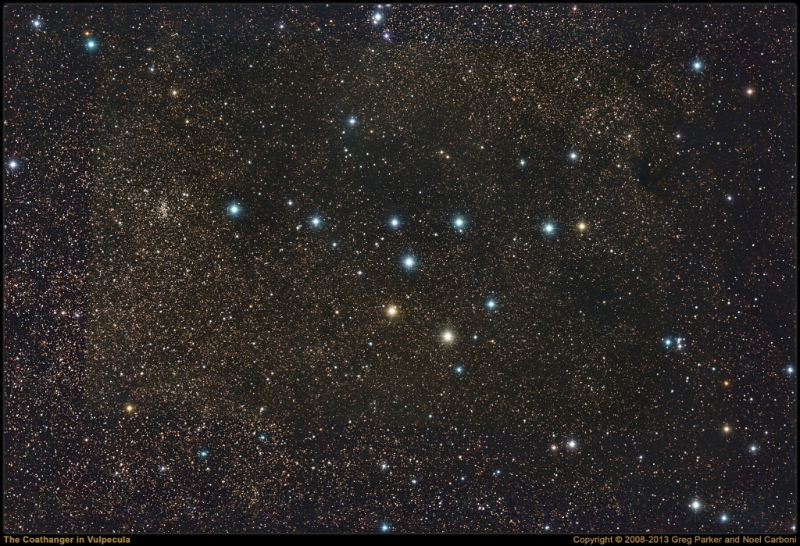 This reprocess by Noel Carboni included data from the mini-WASP array plus deep data from the Hyperstar III. To the left of the cluster we see the sparkling little open cluster NGC 6802, which reminds me a lot of little NGC 1502 sitting at the end of Kemble’s cascade. This image of the Coathanger represents around 8-hours of total imaging time using OSC cameras M25C and M26C. I like the Milky Way background and the prominent dark patches in this image.